These worksheets require trees to determine the prime factorization of a number, including showing expanded and exponential forms. All numbers are made up of prime factors, and the list of primes whose product is a particular number are called that number's prime factorization. 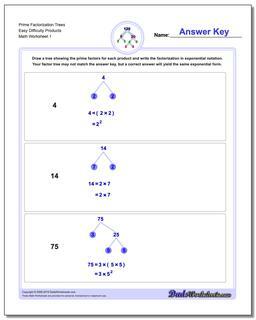 The prime factorization worksheets in this section require students to take a number and break it down into factor tree. There are several approaches to creating a prime factorization, but typically the 'trial method' of simply dividing small primes into the the number is often the easiest approach. Students who are trying to determine a prime factorization will be well served to have memorized the rules of divisibilty for numbers (for example, knowing that even numbers are divisible by two, or that numbers ending in zero or five are divisible by 5) as these provide a quick way to get some of the more obvious factors out and into the factorization tree. Any number that is not prime, that is to say one that has a prime factorization with more than one prime in it, are called composite numbers. When building a factor tree in the course of creating a a prime factorization, you may reach intermediate numbers at internal branching nodes in the tree that are themselves composite numbers and whose prime factorizations are a subset of the factorization of the number you're working on. Prime factorizations are useful for determining the greatest common denominator of two numbers, or to find the least common multiple of two numbers. The prime factorization worksheets in this section are great great practice for both of these skills.